Overland’s 200th issue, believe it or not, has just gone to print. That’s 56 years and 200 issues. Who would’ve thought a humble, left-wing magazine founded by Realist Writers group from the Communist Party would still be hale and hearty in 2010? 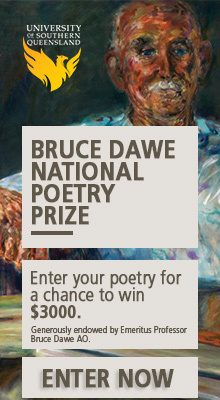 And not just hale, not just hearty, but at the forefront of literature and culture — and with a thriving online community to boot? Seriously though, we are mighty proud that we still produce, time after time, issue after issue, an intelligent and provocative publication. 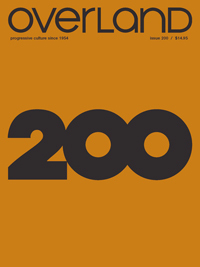 The 200th issue is brimming with controversial essays on culture and politics from some of Australia’s most rebellious writers like Chris Graham, Anwyn Crawford and Clive Hamilton; riveting fiction from Christos Tsiolkas, Janette Turner Hospital and Karen Hitchcock; and a poetic experiment unleashed from the minds of 20 poets working in unison – plus a graphical remix of a story from Overland 1 by Bruce Mutard. This historic edition is going to be launched at a gargantuan and sophisticated shindig at the Melbourne Writers Festival. The night and issue will be launched by distinguished novelist Rodney Hall and current editor Jeff Sparrow, and much good humour and revelry will ensue. Food and drinks on us (at least until the tab is exhausted) at the abovementioned party. Writers, readers, friends and comrades: this is the must-attend event of 2010. We aim to see you there. Huzzah for going to the printer!